Last night we watched the doco 'Forks Over Knives', has anyone else seen it yet? I found it so intriguing and interesting, and maybe for the first time in my life I would actually consider becoming a Vegetarian (or more like, cutting down the amount of meat we consume). Some of the things they brought up about heart disease and health problems and the connection with eating a diet consisting of high animal based products (meat & dairy) was really confronting. Really, it reinforced a lot of changes in our eating habits that we have been making anyway. I wouldn't say that we were eating particularly badly before. We make most things from scratch, like pasta sauce and curries, and rarely do we ever just dump store bought sauces in our meals. But still there were some changes we felt like we wanted to make, like using wholemeal flour and pasta instead of white. 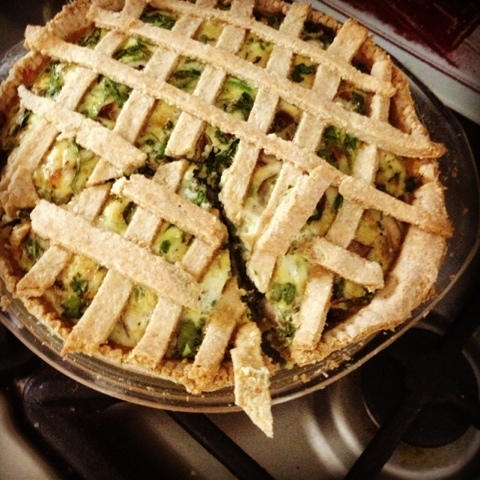 An amazing spinach and mushroom quiche Joel made the other day! I have found for myself with food, it is really hard to change my mindset. I just get a bit stuck, because it seems like a lot of work and when you are used to eating something, its easy to cook, so it is so easy just to keep going the same way. Meaning, that we are trying to stay away from overly processed foods, eating whole-grains and staying away from preservatives, and those things you have no idea of what they are on the ingredients label of food. It is amazing the amount of additives and preservatives that are in so many things, and the packaging doesn't even really clue us in to what it is because they use numbers. I spent a bit of time researching these numbers, and some of them are just plain scary. The more I look into it all, the more it disturbs me. I just want to go back to basics. I don't want my vegetables to be Genetically modified. I don't want to be consuming copious amounts of chemicals. I don't want High Fuctous Corn Syrup. I don't want my Sultanas dried in chemicals. I don't want my Chicken cooled in Chlorine. So I've set a bit of a challenge for myself to put in the effort, find great recipes and learn to love to cook. Because I know, I know, it will be worth it. You can do it with me if you want! It is way better than going at it alone! Here is a great website for some recipes I have found! http://www.thehealthychef.com I tried the pumpkin Lasagna.. AMAZING!! 6 comments on "A Challenge in Eating Clean"
Loooooooove the healthy chef! I'm all for eating clean! I've had that documentary in my instant que on Netflix for a while. I'm gonna check it out now. I need to start watching this. Thanks for sharing.